When we look back a few years from now, this might be the moment we'll say the verb "Olivering" became a thing. 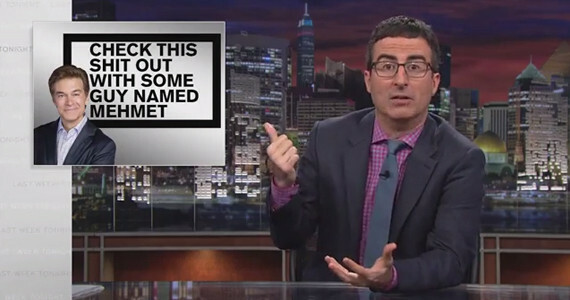 Because Dr. Oz just got seriously "Olivered" on "Last Week Tonight." With Oz's testimony as a jumping off point, Oliver used a full 16 minutes of his show's running time to hammer in the disastrous long-term effects of the deregulation of dietary supplements thanks to their powerful lobbying efforts. More importantly, since Dr. Oz still has an hour-long show to fill every day, Oliver gave him a primer in how to pander to his audience without endangering their lives. Spoiler: It involves Skyping with George R.R. Martin, a T-shirt cannon and Steve Buscemi tap-dancing. Watch the full clip above. You might call it a "magical cure" for false advertising.